A rewarding career doesn’t just happen. You have to keep working at it. To be successful, use these tips. If things get hard, stay positive. Stay current in your chosen career field. Join and be active in professional and trade associations. Use these groups to see industry trends and to add to your network. Lifelong learning is important. Think about short-term training options. Go to the workshops and trainings that your employer offers. Be aware of how changes in your personal life affect your career and visa versa. Know your personal and work values. Develop a sense of purpose. Look over and update your career and personal goals every few years. Also review your goals when big, life-changing events happen. If you need to, you can revisit the steps of this career plan in any order. You can work on more than one step at the same time. Do you have a good attitude toward your work? Ask questions and ask for help when you need it. Accept constructive criticism. If you make a mistake, admit it and find out how to fix it. Before you look for a promotion or a new job, learn all that you can in your present job. When you get a performance review, use it to learn how you can do your job better. Be prepared for the New World of Work. 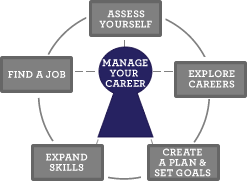 Make sure you are clear about What Career Management is. Update your Career Plan (Exercises 3.2) as needed.